10 absorbent washable wipes in rounded squares of double sided knitted bamboo. Use to wipe hands, faces or bums. Replaces the need to buy disposable baby wipes. Save money and landfill space, ditch the disposables today. Disposable baby wipes have a large carbon footprint too. They are always found in plastic packaging in the shops. 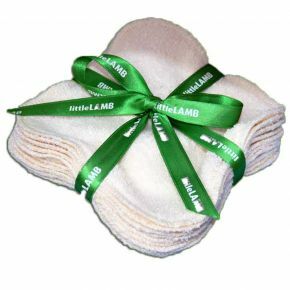 Switch to reusable wipes and you can control what chemicals you put onto your babies skin. I wet with plain water or water and baby wash. When out and about I always carry some reusable wipes to clean hands and faces in a wet bag. Wash the same as other laundry, however do not use fabric conditioner. Size 15cm x 15cm. They shrink a bit in the wash and the ends may curl. Does not affect their use.